Rockville residents interested in joining a new cooperative solar energy group can learn more at a May 5 meeting at City Hall. 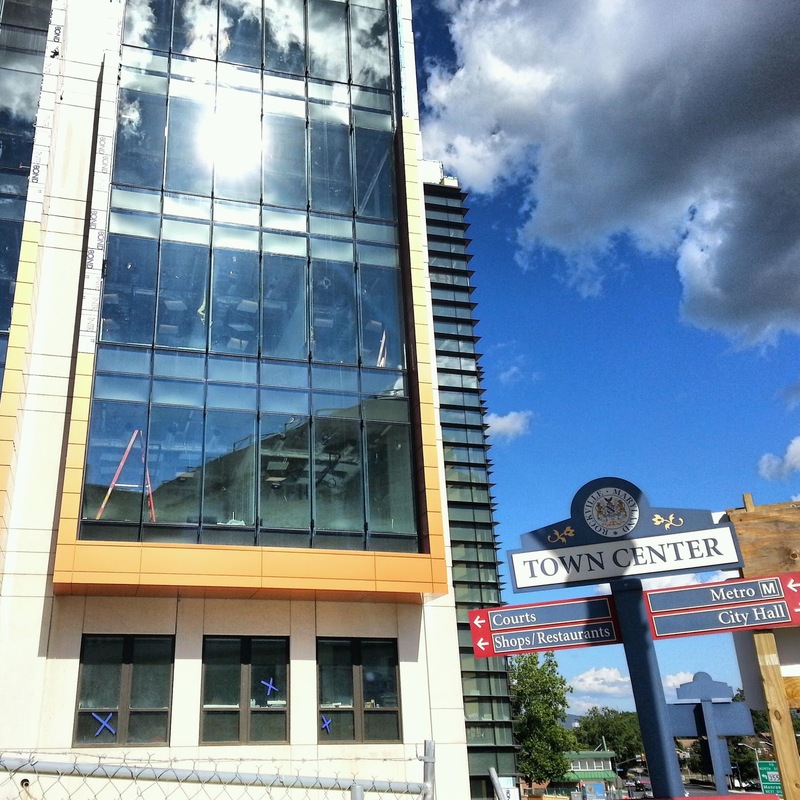 The City of Rockville is providing outreach support to an enterprise of MD SUN and Community Power Network, and the Rockville Environment Commission is organizing the effort. The meeting will be at 7:00 PM, and you can register online. This is only one of many alternative energy options out there. Homeowners should examine these programs carefully, and consider the pros and cons - as well as the age of their existing roof - before signing anything or installing solar panels. Clark Reed, a Rockville Environment Commissioner, says that reverse metering will be available, and that residents who sign up in May will be able to get solar panels installed by September or October. 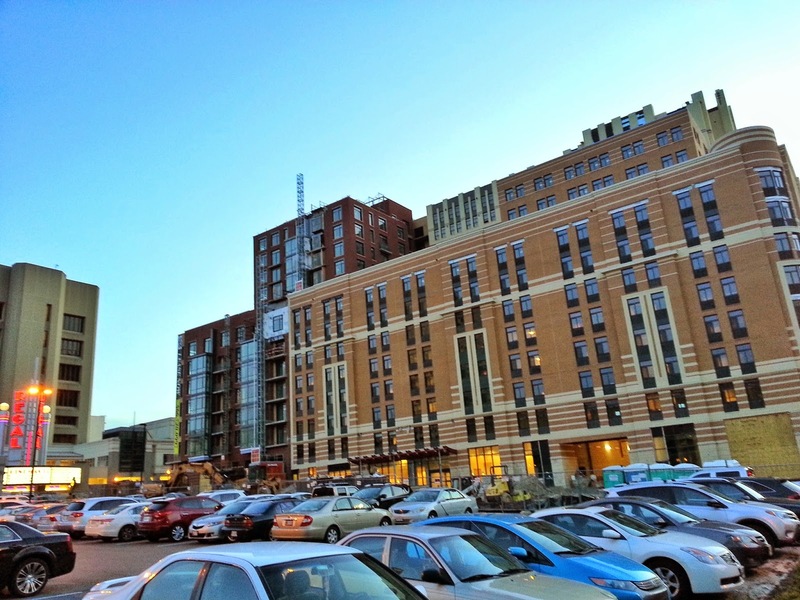 The presidential contest turned primarily on questions of how dense development should be around the Twinbrook Metro station, with Crow favoring taller buildings. 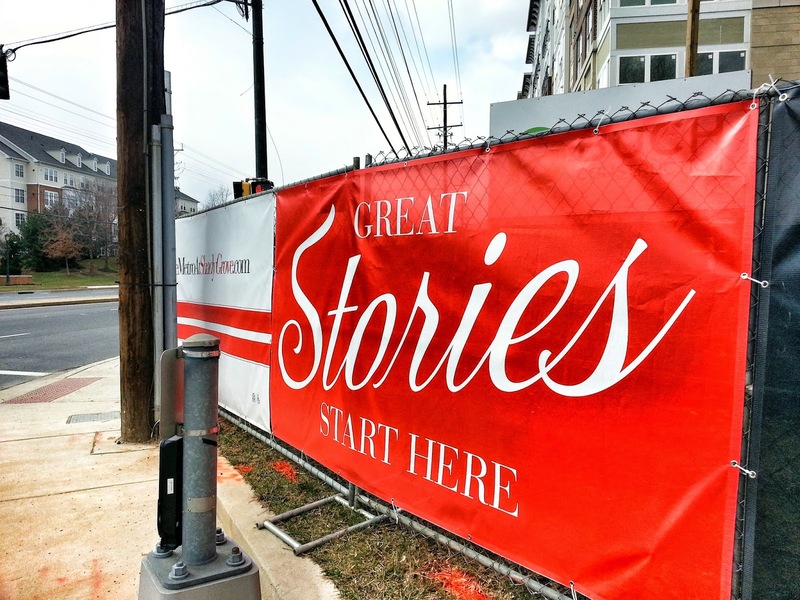 How to get more residents involved in the association was another issue, as was the association's handling of nearby development like the B.F. Saul project and Rockville Pike Plan. Gottfried cited the increase in turnout for important meetings since he took office a year ago, and outlined plans for further outreach, such as partnering with the Recreation Center's movie nights this summer. After the vote, Gottfried and Treasurer Christina Ginsberg discussed some of the priority issues that will most affect Twinbrook in the coming year. 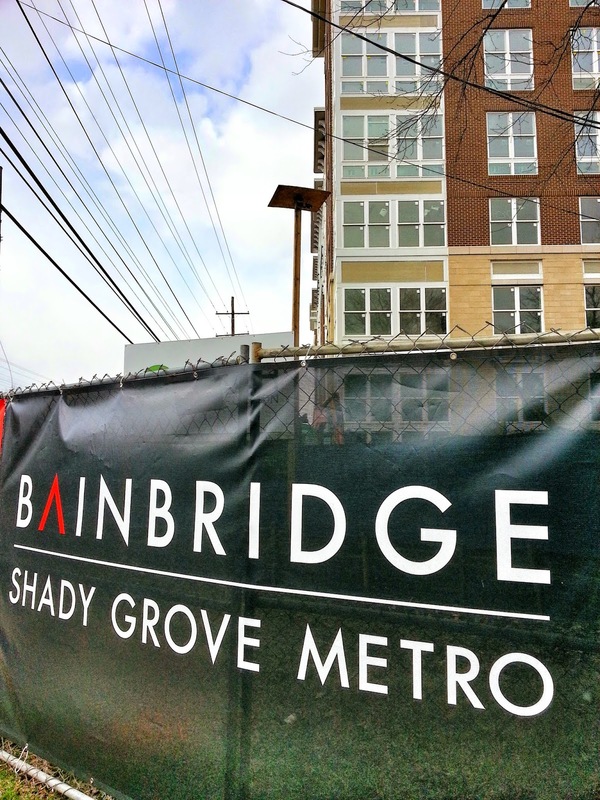 Ginsberg cited the likely return of Montgomery County Executive Ike Leggett's proposal for an appointed taxing authority this fall, and the debate over potential historic preservation efforts that could impact property values, as the two biggest issues. Ginsberg said historic designation would hurt home values, sending potential buyers to adjacent Aspen Hill where they wouldn't have to get every exterior change approved by the Historic District Commission. Gottfried said the county's bus rapid transit proposals, expansion or replacement of the Twinbrook Recreation Center, the need for a sprinkler system at Twinbrook Elementary School and a streetlight at Halpine Road and Ardennes, the APFS school standards debate, and requiring more developer investment in the neighborhood, are among at least 30 issues he will be working on in the months ahead. He said the association will begin lobbying the Mayor and Council on needed projects this fall for next year's budget decisions. Among issues brought up by residents was men gathering to drink in Rockcrest Park, who are leaving glass bottles behind on park property that borders several homes. 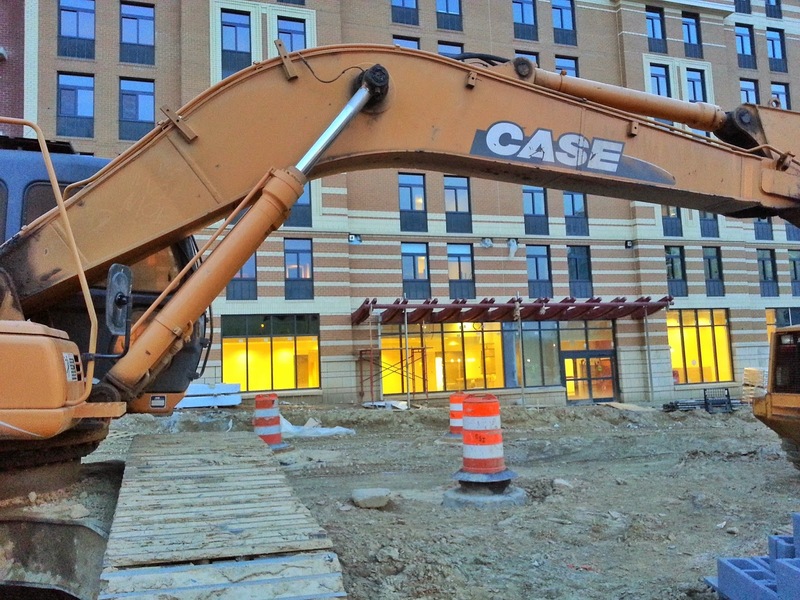 Rockville residents who just beat back yet another attempt to weaken the city's Adequate Public Facilities Standards may be experiencing a sense of deja vu. 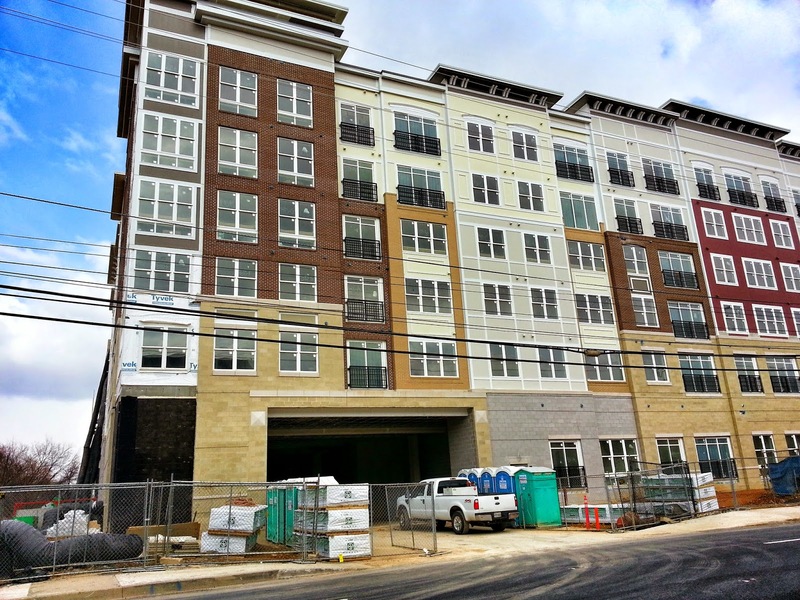 The proposal to align the APFS school overcrowding provisions with Montgomery County's weaker standards is back, and could face a vote on May 18 or June 1. City Manager Barbara Matthews told the Mayor and Council last night that the final date would depend on which meeting had space to add the APFS to the agenda. The discussion and "possible vote" on the APFS changes was allowed onto a future agenda last night, under the rule that 3 Council members can request an agenda item be added for a specific meeting date. Councilmember Virginia Onley brought up the topic for the second week in a row, saying again that she felt it was critical to have a "discussion" on the APFS. Councilmember Tom Moore, who has led the effort to change the APFS standards, said that due to the large turnout of residents at two public hearings on the topic, the proposal should be put to a vote, as well. Mayor Bridget Donnell Newton noted that there would have been a vote February 9, but that Moore withdrew his motion that evening, when he realized it would fail. Councilmember Julie Palakovich-Carr also favored a discussion and possible vote. Onley said she was more concerned about having a discussion than a vote. Councilmember Beryl Feinberg said she preferred to focus on the more-urgent budget and compensation issues before the council at the moment. Newton said it was clear the proposed changes were opposed by a majority of residents who testified at the public hearings. The request by Moore, Palakovich-Carr and Onley means there could potentially be a vote on the highly-controversial issue within the next 40 days. 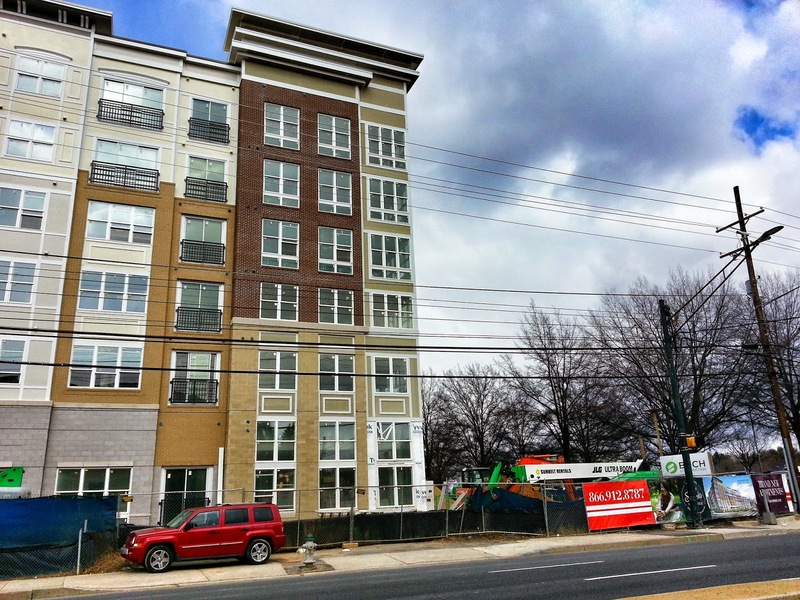 Future Korean and Asian fusion restaurant Miso Café has posted Coming Soon signage at its space in Rockville Town Square. 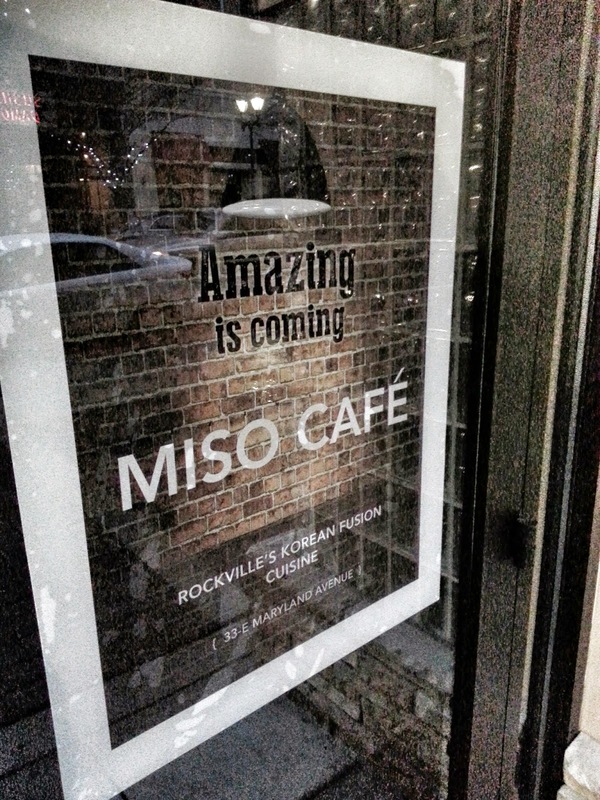 Miso Café is expected to open this summer. 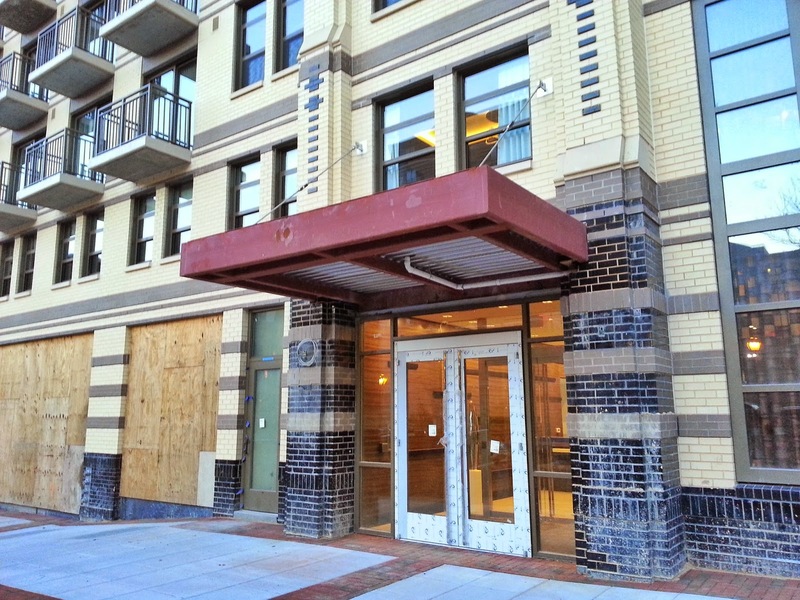 The Rockville Planning Commission granted a schools waiver from the city's Adequate Public Facilities Standards to the Quality Suites hotel that is converting into senior housing. Located at 1380 Piccard Drive, the 219-room hotel will become a 203-unit senior housing development. 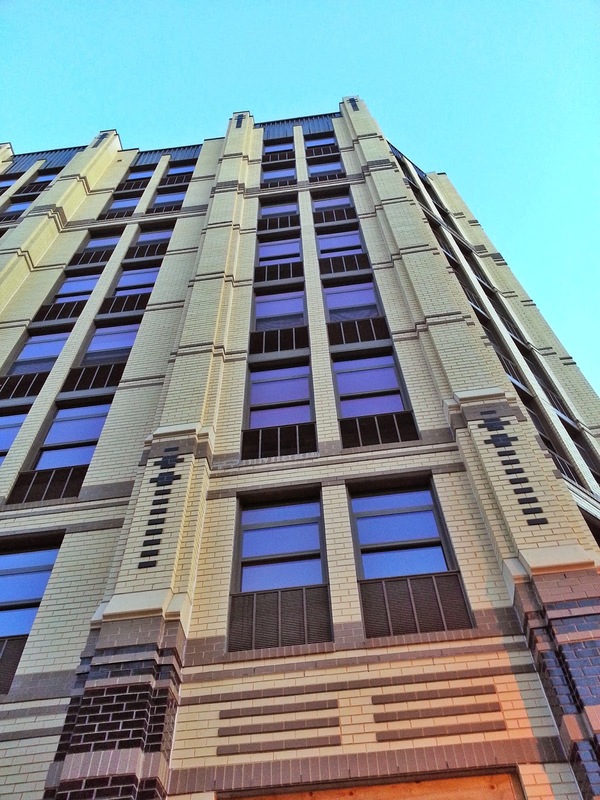 No exterior changes are planned for the building. Commissioner Charles Littlefield expressed concern that the development, while limited to seniors, would impact the city's most overcrowded school, College Gardens ES, if it somehow ever generated any students. 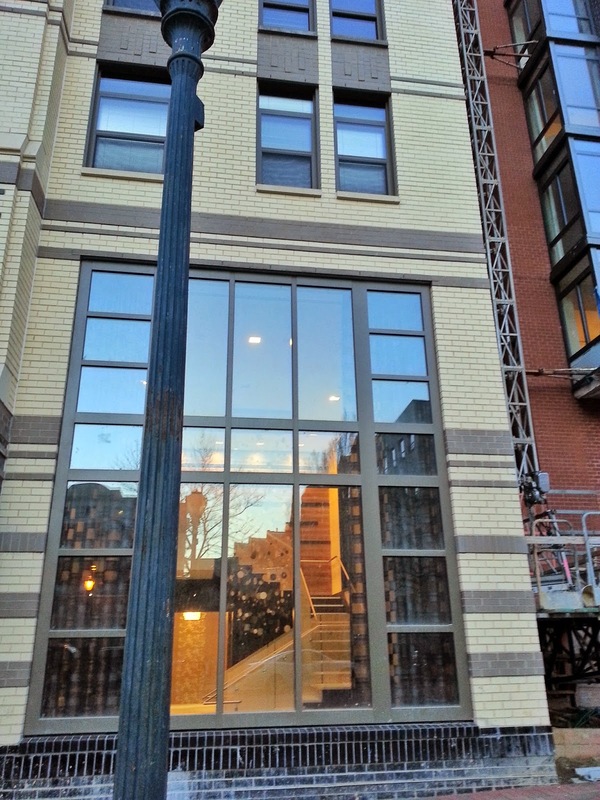 Erica Leatham of Ballard Spahr, LLP, the applicant's attorney, said that the only residents under 62 who could live in the building would be caregivers. One related question to that was, what if sneaky parents try to use the former hotel's address to enroll their kids at College Gardens? 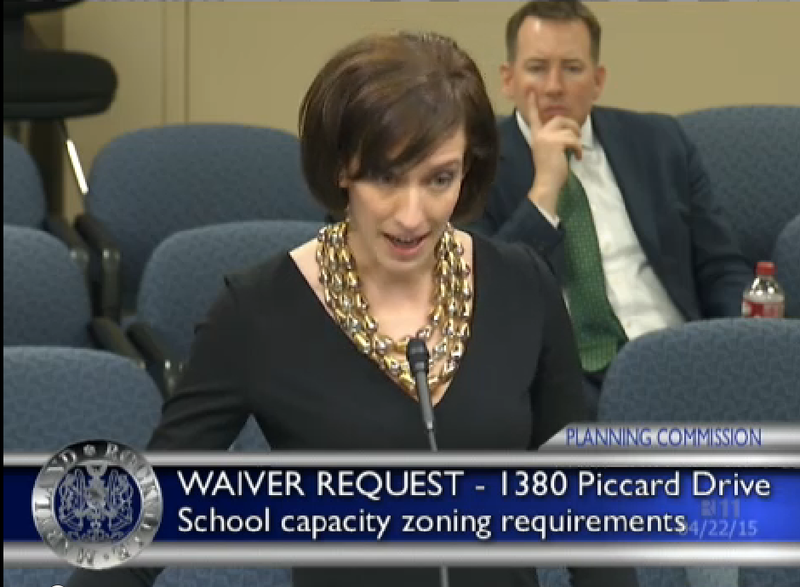 Commissioner Jack Leiderman asked if the city could communicate to Montgomery County Public Schools that anyone applying from the address of 1380 Piccard Drive should be rejected by the school system. Staff Liaison Andrew Gunning affirmed that could be done. Littlefield asked if the applicant intended to operate the housing once it opens. Leatham said it does for the immediate future, but added that it is impossible to speculate about a future transaction a decade down the road. 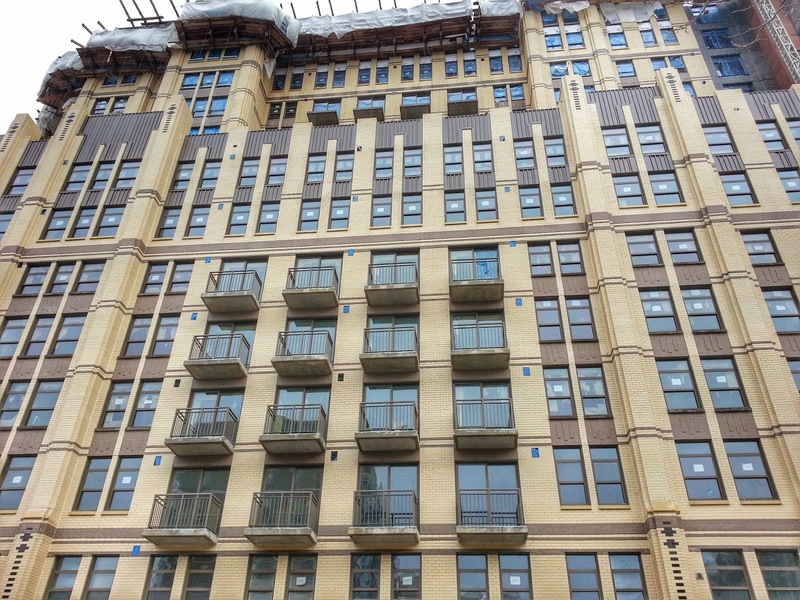 Commissioner David Hill questioned the demand for senior housing at that location. Leatham said that her own parents had recently applied to the Ingleside senior residence at King Farm, and were told it would be a 5-6 year wait. "There's clearly a pent-up demand," she said. Commissioner Anne Goodman noted that a friend of hers was accepted at Ingleside in only 7 months. Leatham jokingly said she would have to take that up that apparent discrepancy with Ingleside. Thoughts on the hotel's current parking lot were mixed. 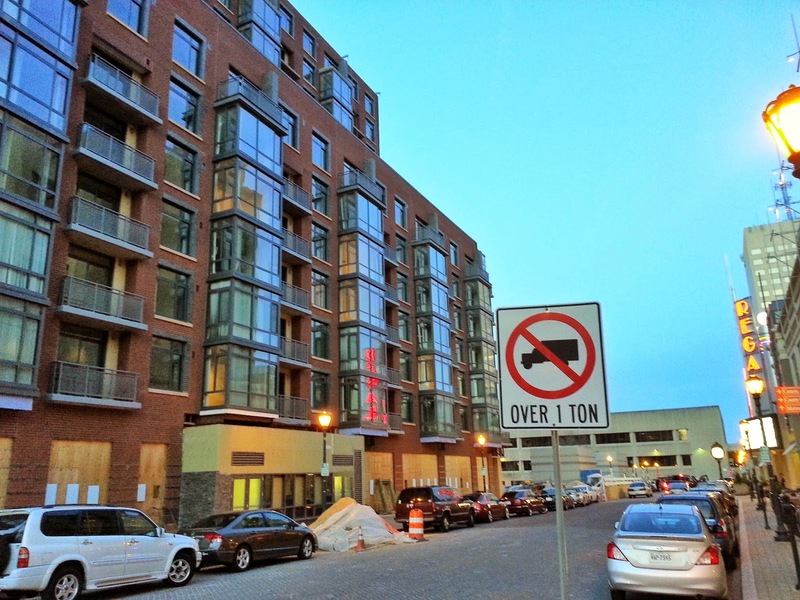 Hill felt the opportunity exists to reduce parking in favor of more green space around the building. But Leiderman said that would not be advisable. 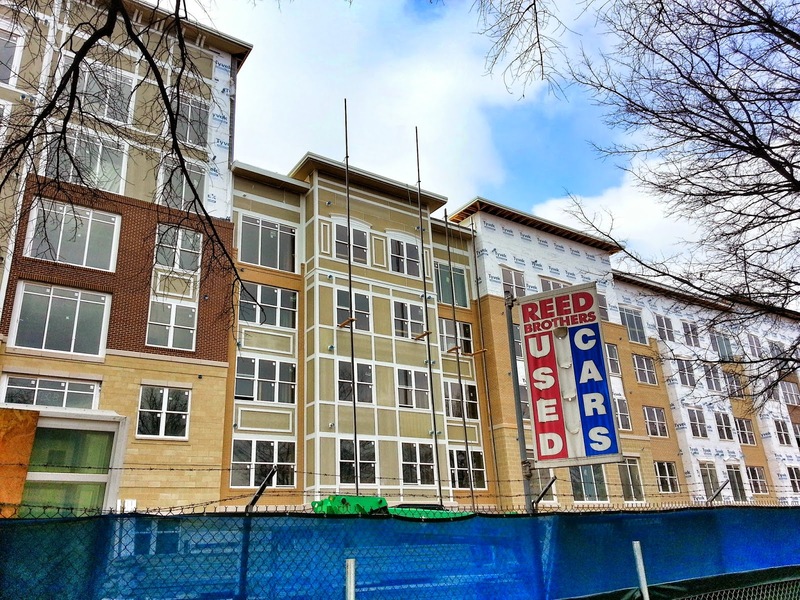 It turns out there are only 216 parking spaces for the 203 units. That could easily be filled if only 13 residents had two cars. And that does not begin to include parking for caregivers and visitors. 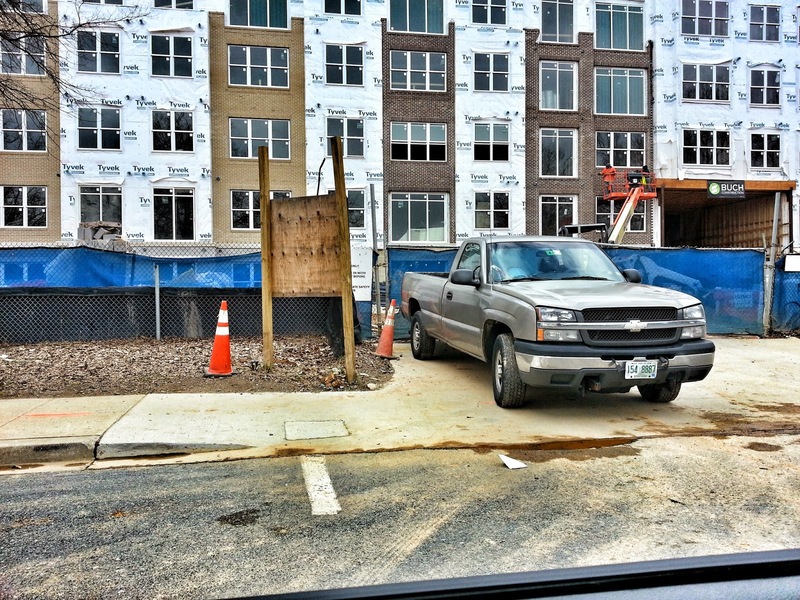 If anything, it appears parking would be at a premium. "I don’t see a lot of seniors who are going to give up driving to live out by 270," Leiderman said, citing the poor access to rapid transit at the site alongside Interstate 270. Otherwise, commissioners were in agreement on the main points of the waiver request Wednesday night. They voted unanimously to approve the waiver, which required a supermajority for approval. The motion was made by Commissioner John Tyner, and seconded by Goodman. 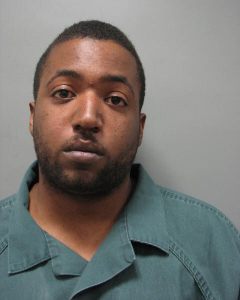 Montgomery County Police have arrested and charged a suspect in a February sexual assault in Rockville. Warren Matthew Giddings, age 23, of the 11900 block of Castle Pines Way in Waldorf, has been charged with three counts of First Degree Sexual Assault, three counts of Second Degree Sexual Assault, 3 counts of Vulnerable Adult Abuse, and Theft under $1,000. He is currently being held on a $150,000 bond. Giddings is accused of sexually assaulting a 20-year-old woman who has cognitive learning disabilities. He met the victim through an online dating website, and the assault took place at the victim's home in Rockville, police allege. They also accuse Giddings of stealing the victim's tablet computer while in the home. Detectives are asking anyone who believes she may be a victim of inappropriate contact by Giddings (pictured below), or anyone who has additional information about this case, to contact Montgomery County Police-Special Victims Investigations Division at 240-773-5050. 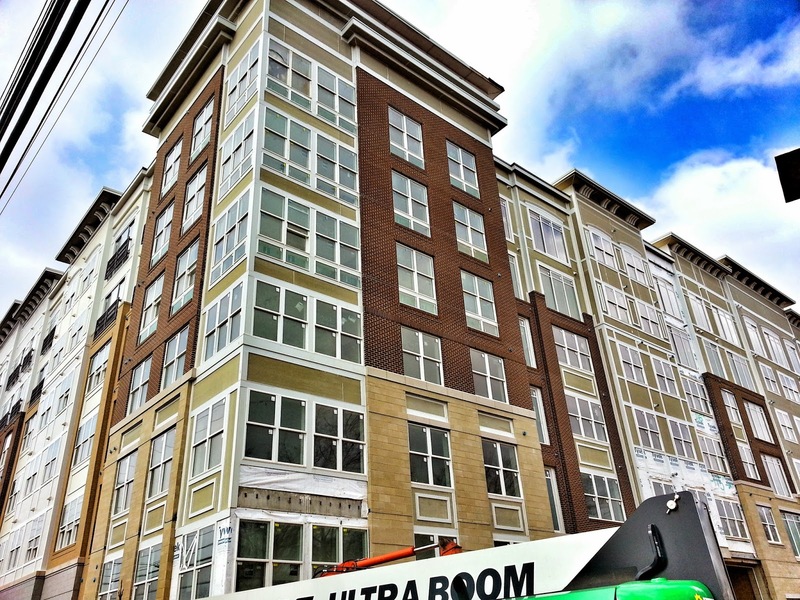 The Upton luxury apartments are scheduled to open May 1, and the Cambria Suites hotel is nearly ready to open, as well. 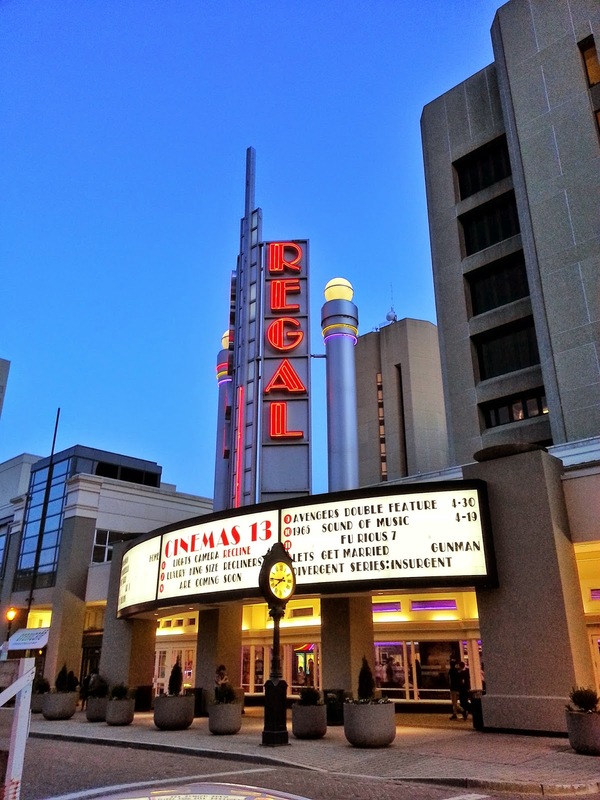 A second tower will eventually be built on the remaining half of the municipal parking lot in front of the Regal Rockville theater. The refinement of legislation that would allow backyard chickens in Rockville led the Mayor and Council through a discussion lasting over two hours Monday night. Many practical details that had not been previously considered came up, including the potential for chickens to get frostbite if future winters resemble the past one. Councilmember Julie Palakovich-Carr, who has led the effort to update the city's code regarding animals and pets, said that a properly-sized coop will utilize the body heat of chickens to protect them from winter temperatures. Councilmember Beryl Feinberg expressed concern that heating systems could lead to fires. She cited events in other jurisdictions, where such coop fires had caused as much as $500,000 damage to homes they were in the backyards of. Feinberg felt there should be a special exception process to give neighbors a say in whether such chicken operations could be allowed next door to them. Councilmember Tom Moore strongly objected to that potential amendment, saying a resident's decision to have chickens would be no different than his ability to construct a by-right garage on his property. Mayor Bridget Donnell Newton eventually had to postpone the debate to a future meeting, citing the late hour. Newton said the questions of neighbor notification or special exceptions, among others, were significant enough to merit further discussion. The meeting adjourned at 11:55 PM. One interesting issue that emerged during the debate was the potential for individual HOAs to ban chickens, if enough residents opposed them, even if the provision passes. 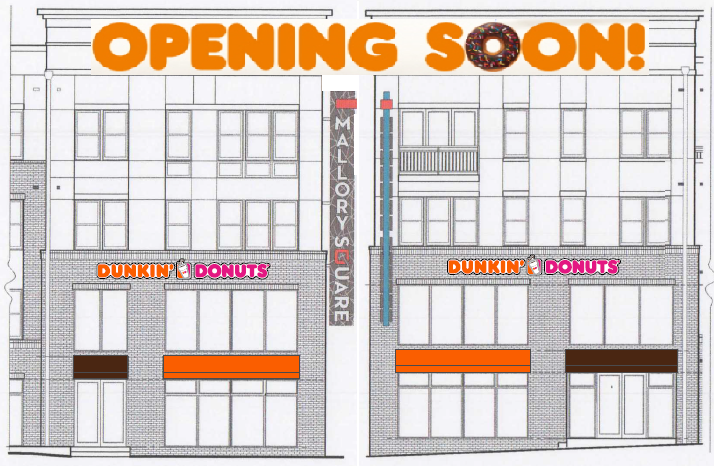 The recent opening of a drive-thru Dunkin' Donuts in College Plaza was not the end of the chain's expansion in Rockville. Boris Lander, Principal of the local franchise group, says another location will be coming this summer to the new Mallory Square development, at 15235 Siesta Key Way. 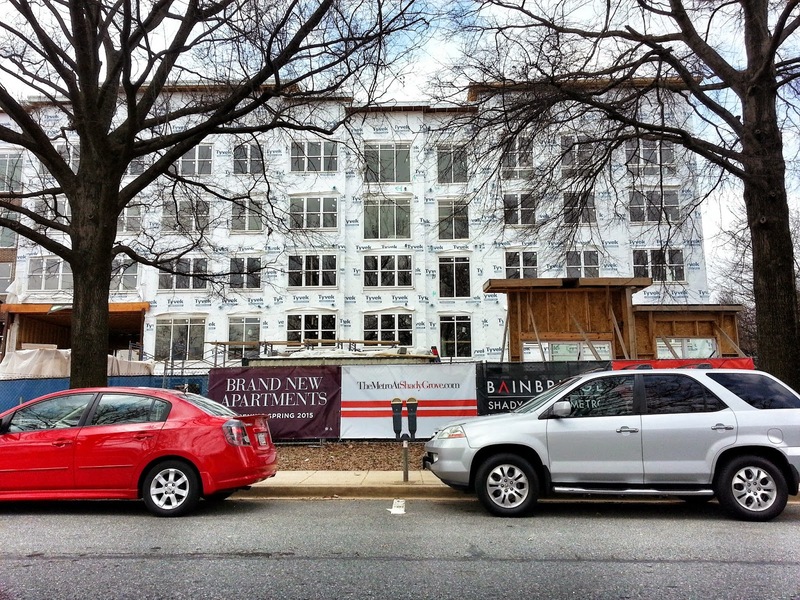 A plan for representatives of the Rockville Historic District Commission to attend the April 28 meeting of the Twinbrook Citizens Association meeting was confirmed at last night's commission meeting. No details of the format or agenda were given last evening. Confirmed to attend so far are Commissioner Jessica Reynolds and the commission's Staff Liaison, Sheila Bashiri. In a previous discussion, it was said to be an opportunity for residents to learn about their options for historic preservation or designation for their homes or neighborhood. The meeting will be held at 7:00 PM on Tuesday, April 28, at the Twinbrook Community Recreation Center at 12920 Twinbrook Parkway. The commission also declined to endorse a proposal to allow construction of a new home with an attached garage at 102 South Van Buren Street last night. 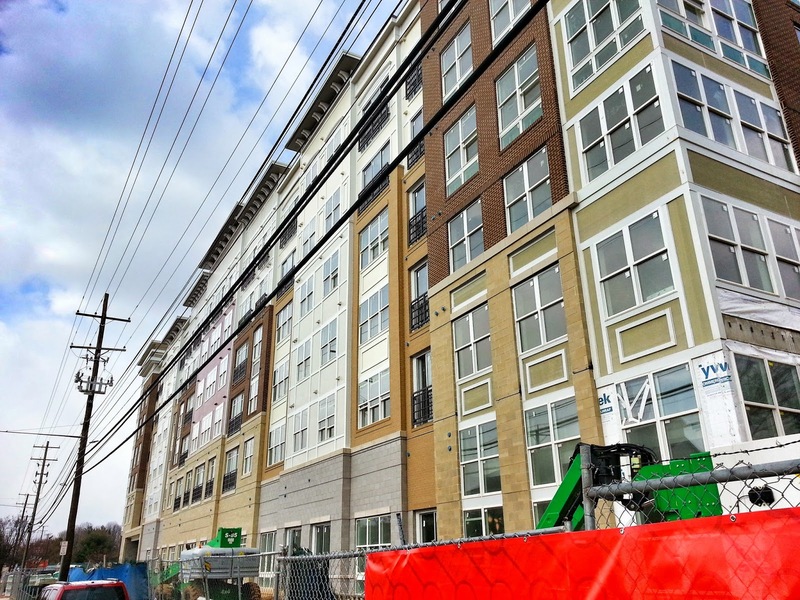 Commissioner Rob Achtmeyer expressed concern that approval would set a precedent for how infill development is handled within historic districts. Reynolds agreed, saying it would start the city down a "slippery slope." Achtmeyer said a house with a front-facing attached garage was not appropriate in the historic district the site is located within. This was a courtesy review, and no formal vote was taken. Gatsby Way would seem to have the most logical connection to Rockville. However, city staff is recommending against Gatsby, stating that there is already a street named "Gatsby" in the county. It cites the zoning ordinance forbidding name duplication of streets already existent in the county. 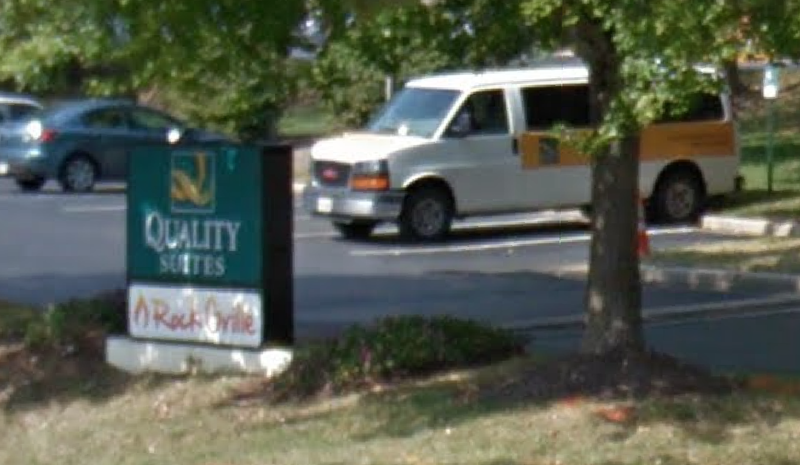 The other most logical name, to my mind, would be Quality Court - named after an earlier Choice Hotel brand, Quality Courts. That is a bit of a relic of the 1970s and earlier, but does have a connection to the company. But that, too, has been rejected by city staff, who argue that the street will not technically be a "court," causing driver confusion. Staff is recommending Bainum Way or Convergence Avenue. 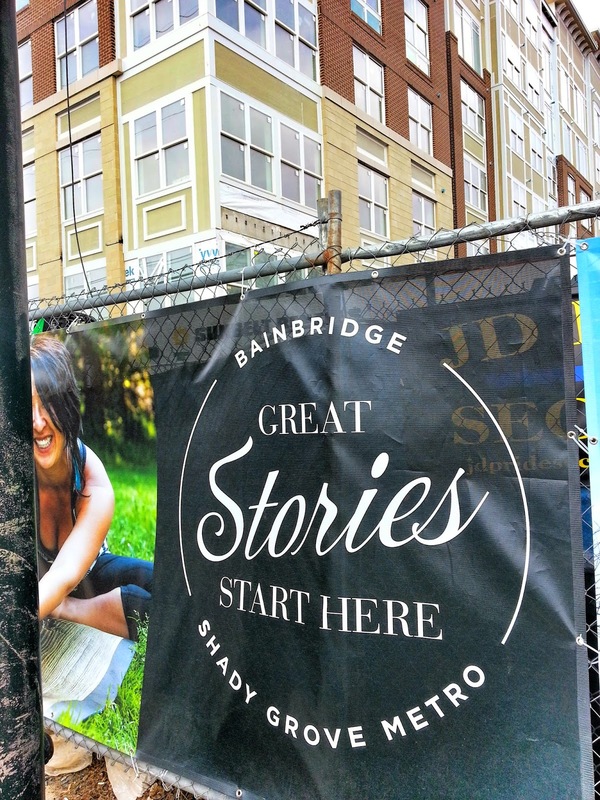 Bainum refers to Choice founder Stewart Bainum, and the staff memo suggests Convergence is symbolic for the "coming together of activities in Town Center." Renaissance apparently fell out of favor with Choice, as it is a brand associated with a competing chain of hotels. The matter will be taken up by the Commission at its April 22 meeting at 7:00 PM at City Hall. You may recall the Commission rejected an earlier attempt by Choice to rename part of E. Middle Lane as "Choice Hotels Lane" in 2011. The Mayor and Council are scheduled to meet tonight at 7:00 PM at City Hall to discuss the city's Compensation and Classification Study. But the Rockville Police union, FOP Lodge 117, is already concerned about the city's failure to offer what other jurisdictions provide their officers. 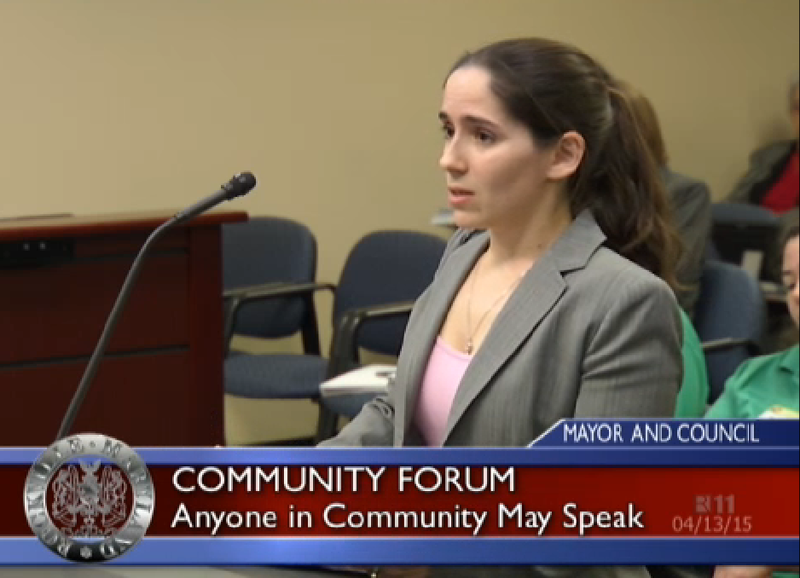 Lodge 117's president, Michelle Milne, appeared during the Community Forum at Monday night's Mayor and Council meeting, expressing concern that she might not have an opportunity to speak tonight. Milne said officers are particularly concerned about two issues. First, the city does not offer a salary step scale, making it difficult for officers to forecast their income, she said. A corporal assigned to the department's Criminal Investigations Unit, Milne said that shortcoming is "unheard of in a department in this area." Noting that the physical demands of police work limit the productive earning years an officer can serve, Milne said, "I might be able to work for 25-30 years, and that’s kind of pushing it. I can’t get into a foot pursuit at 55 or 60." She argued that the department will have a hard time attracting and retaining officers without a step scale, like "all of the other departments around us are getting." Another area of dispute is in-grade seniority. Milne, who said she has been with the department nearly a decade, said that the city's current system can leave officers with varying lengths of service time making similar salaries. Mayor Bridget Donnell Newton instructed city staff to add a Community Forum to the agenda for tonight's meeting, which will allow anyone to address the Mayor and Council. Call 240-314-8280 by 4:00 PM today, or use the sign-up sheet before the start of the meeting. 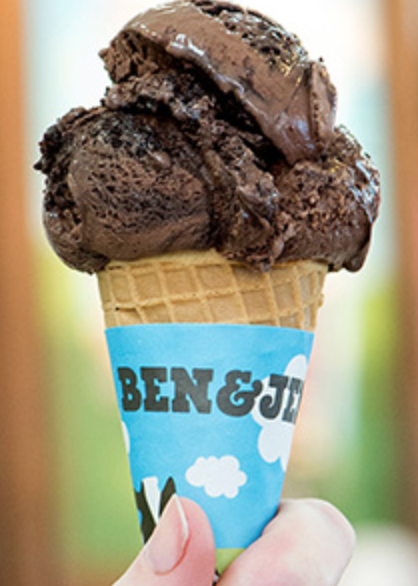 Today, April 14, is the annual Free Cone Day at Ben & Jerry's, located at 199-F E. Montgomery Avenue in Rockville. Stop by between noon and 8:00 PM tonight for a free, one-scoop cone of your favorite flavor. The ice cream chain is also suggesting 10 ways to pass the time while waiting in line for your free cone. Rockville Historic District Commissioners will consider a request to demolish a home, and a garage, at 704 W. Montgomery Avenue at their meeting this Thursday. Also on the agenda, is a potential meeting between the HDC Commissioners and the Twinbrook Citizens Association for April 28. 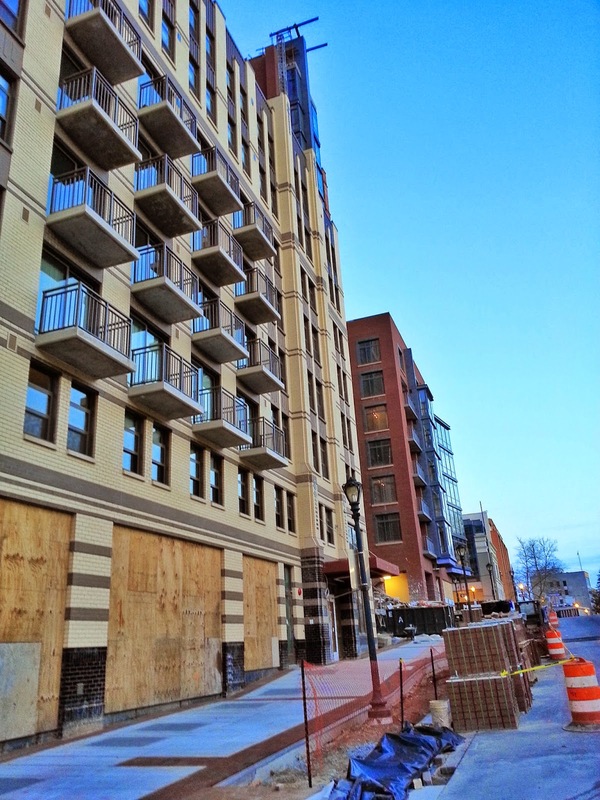 That announcement last month took some residents by surprise, so we may get some more details this week. The meeting will be this Thursday, April 16, at 7:30 PM, in the Mayor and Council chambers at City Hall. It will also be televised on Rockville Channel 11. 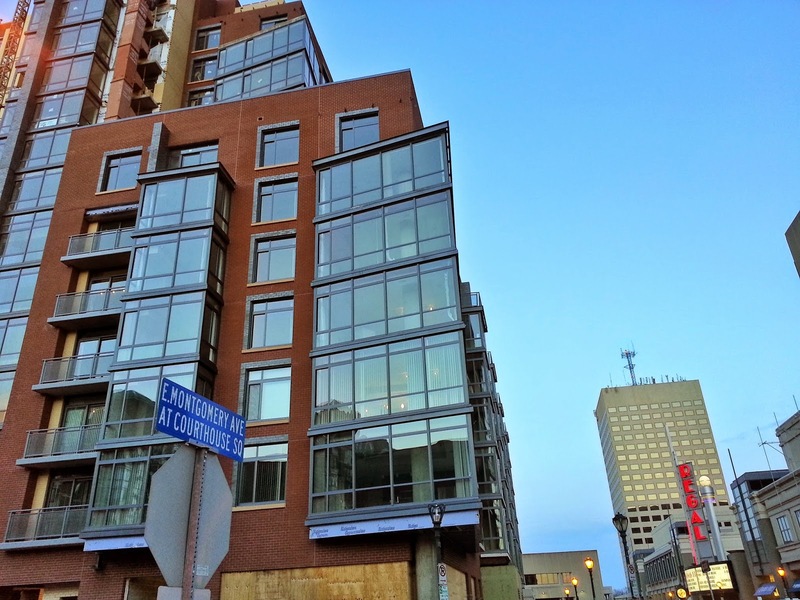 Lebanese Taverna has a limited-time offer involving two of its locations in Federal Realty developments. 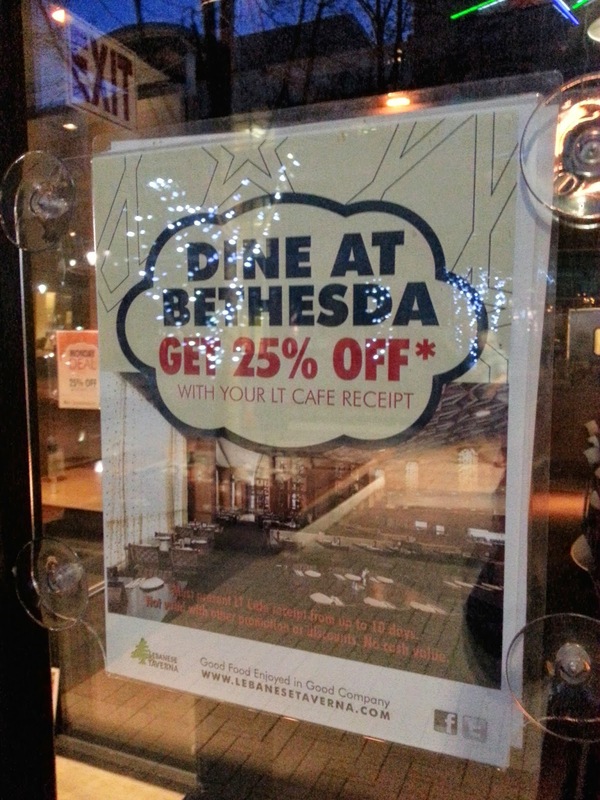 If you dine at their Rockville Town Square location, and take your Rockville receipt to their Bethesda Row location within 10 days, you'll save 25% on your meal in Bethesda. A kitchen fire brought Montgomery County Fire and Rescue personnel to Noodles and Company last night. The fire was quickly extinguished, and there were no injuries, according to MCFRS spokesperson Pete Piringer. 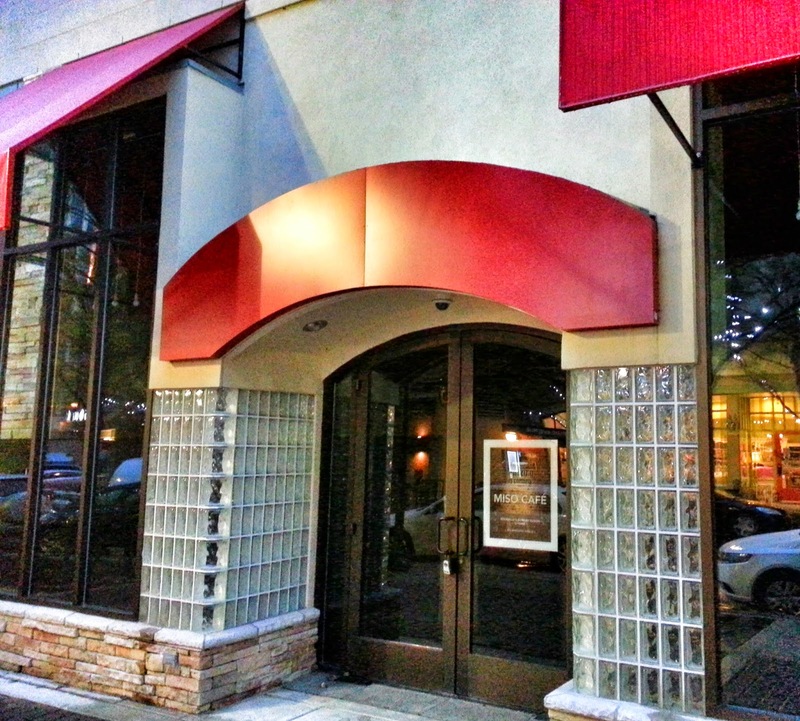 However, there is no word - as of this writing - as to if the restaurant will reopen today, or the extent of the damage. 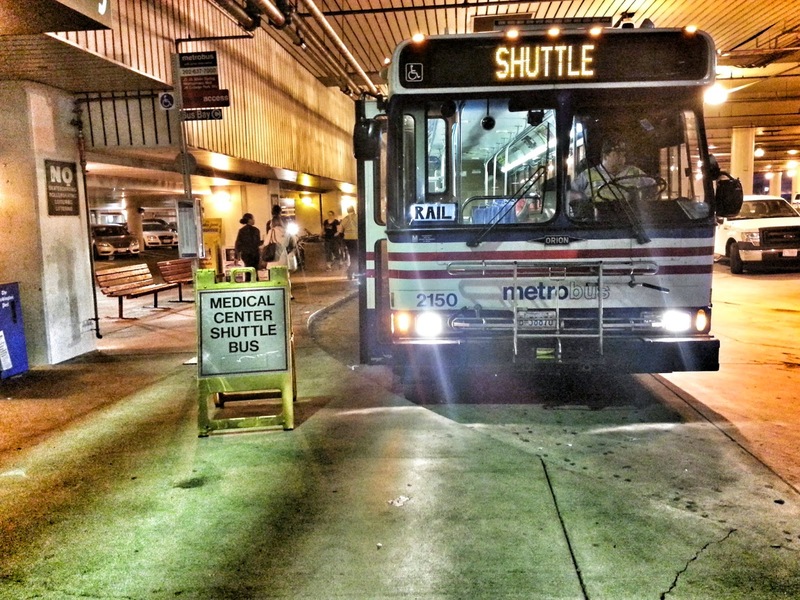 Montgomery County elected officials' widely-panned proposals for Bus Rapid Transit, and a powerful new taxing authority to force taxpayers to foot the bill for it, have generated rage and controversy countywide. But expensive transit projects are not the only way to address Montgomery County's nation-leading traffic congestion. 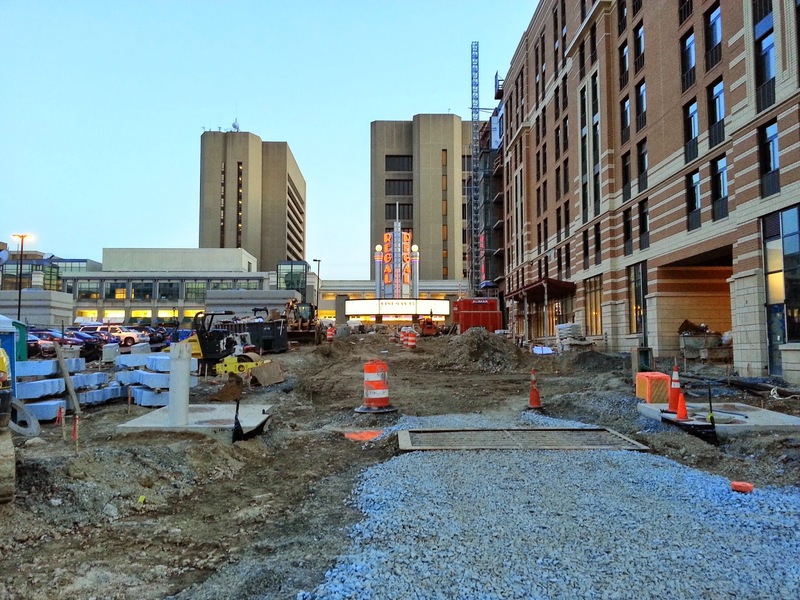 There are the county's long-delayed master plan highways, such as the Midcounty Highway Extended (M-83), Rockville Freeway and new Potomac River crossing to Northern Virginia, that need to be built. And there are ways to better manage our existing roads and highways, and bus service, through rapidly-advancing technology. The Montgomery Civic Federation will be hosting an interesting discussion of the latter at its Monday, April 13 meeting, which will be held in the First Floor Auditorium of the County Council Office Building, at 100 Maryland Avenue in Rockville, at 7:45 PM. Speakers at the Transportation of the Future seminar will include representatives for the United States Department of Transportation's Beyond Traffic initiative, and the Intelligent Transportation Society of America (ITSA). In addition, Christof Spieler, a member of the Metro board in Houston, Texas, will join the meeting via conference call. According to Jim Zepp, MCCF First Vice President, Spieler will discuss how Houston was able to use technology to greatly improve existing bus service in the city - and unlike BRT or the ITA, this was accomplished at no cost to the taxpayer. 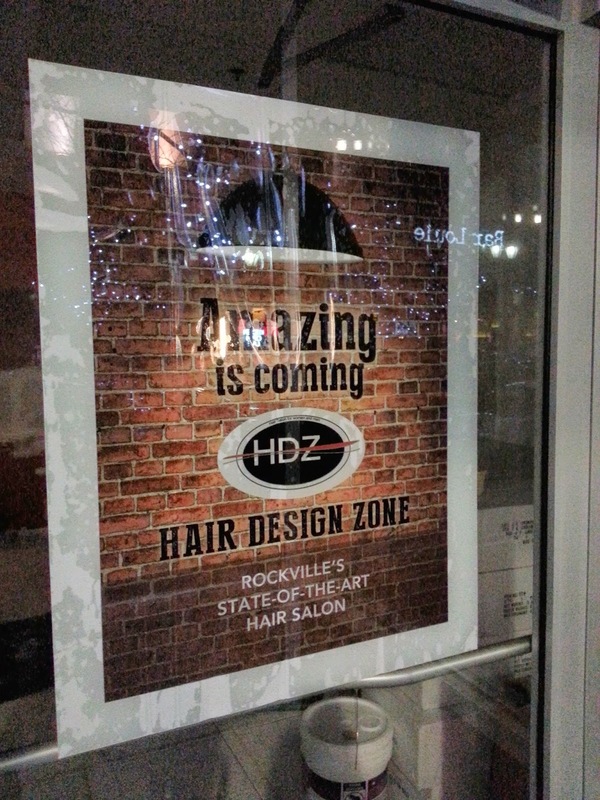 Some coming soon signage has appeared at the future home of Hair Design Zone, at 141-C Gibbs Street in Rockville Town Square. Owner Juan Ma is a veteran of top salons in Japan. 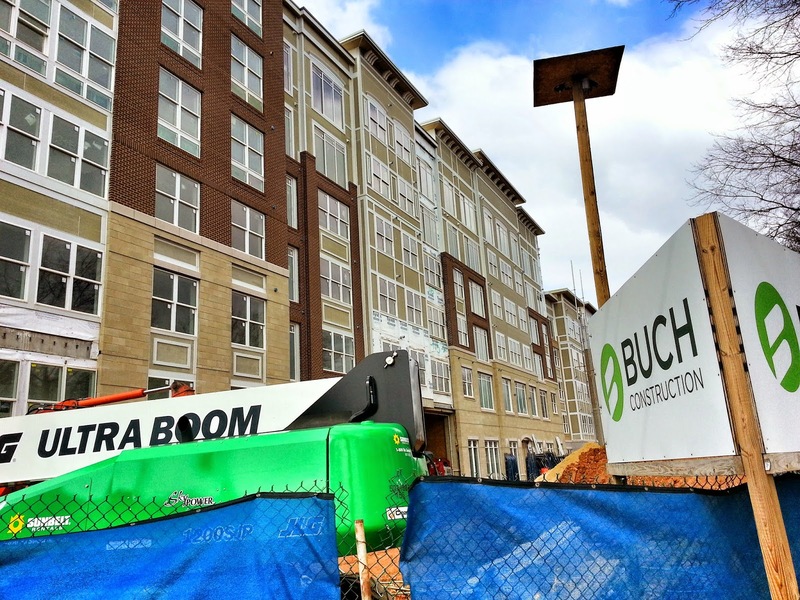 The future Cambria Suites hotel, nearing completion in Rockville Town Center, has applied for a liquor license. 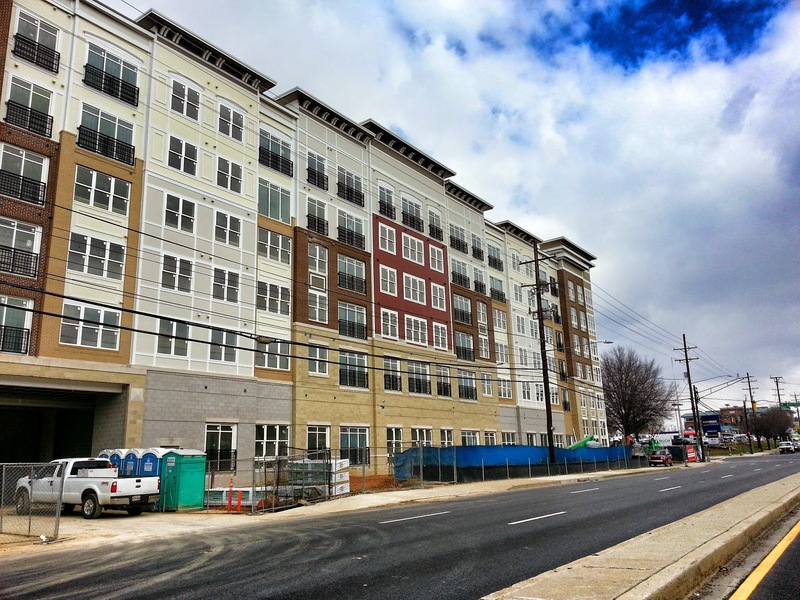 A hearing on the matter will be held on Thursday, April 16, at 11:30 AM by the Montgomery County Department of Liquor Control's licensing board. 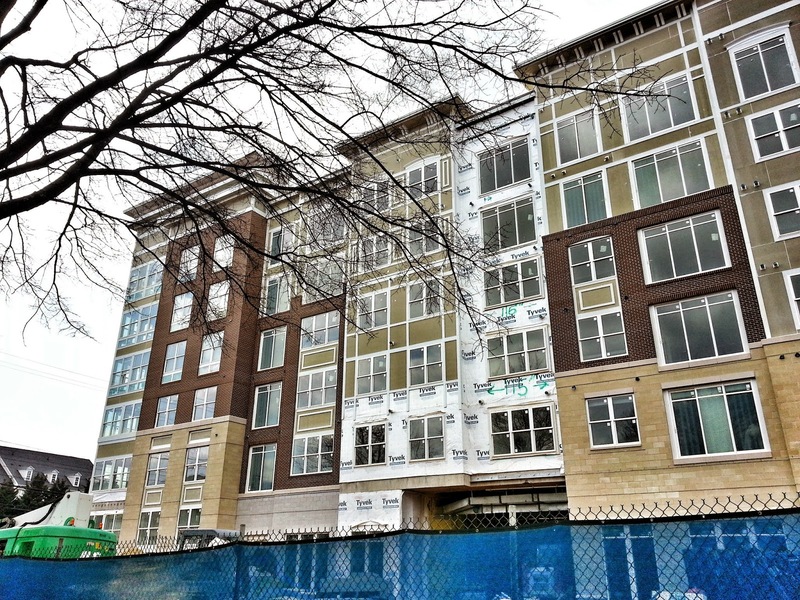 The Quality Suites at 1380 Piccard Drive wants to convert its building into senior housing, and has requested a waiver from Rockville's Adequate Public Facilities Standards requirements. Under their plan, the 219 room hotel would become a 203-unit seniors-only (age 62+) apartment building. Their development application was approved by the city's planning chief, Jim Wasilak, on January 10. 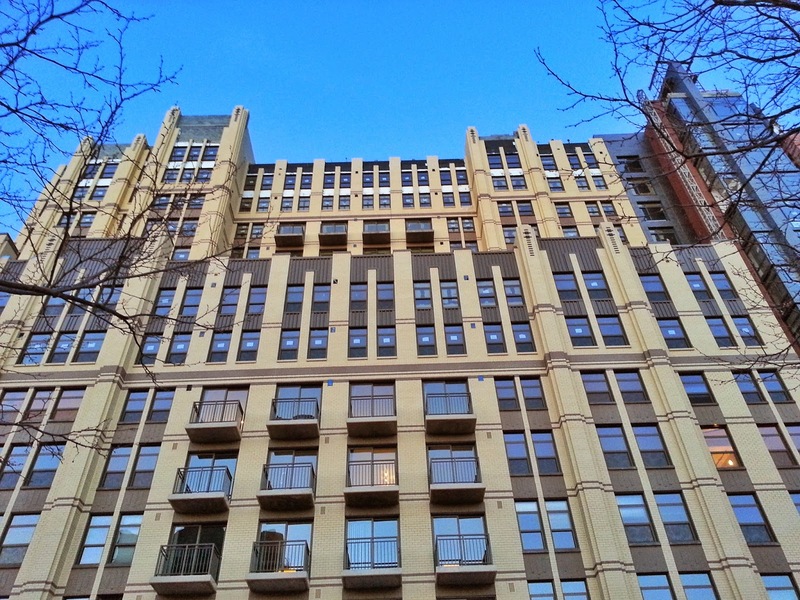 Because no exterior changes are being made to the building, the Chief of Planning was the approving authority in that case. However, the applicant must obtain a minimum of 5 approving votes from the Planning Commission to receive the APFS waiver. Based on the current APFS standards, city planner Nicole Walters says the applicant is eligible for the waiver. 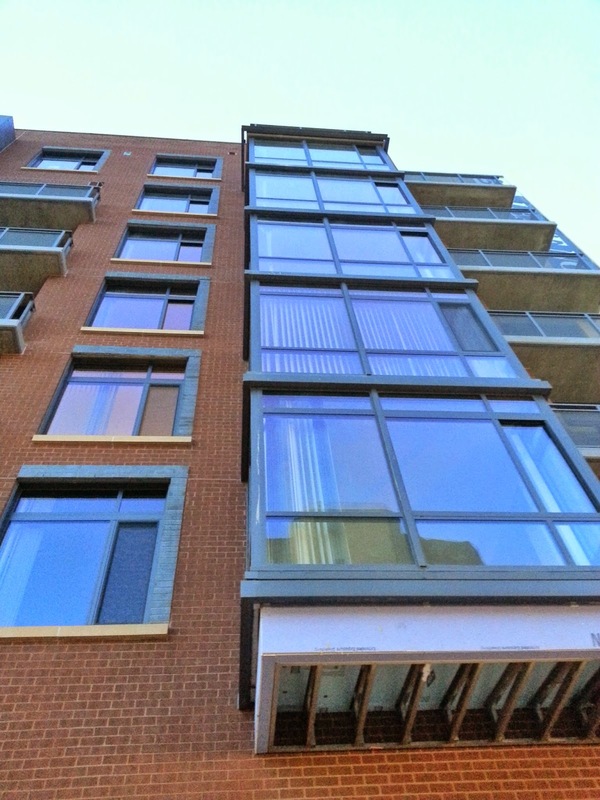 The rules allow exemptions for "age-restricted residential uses." 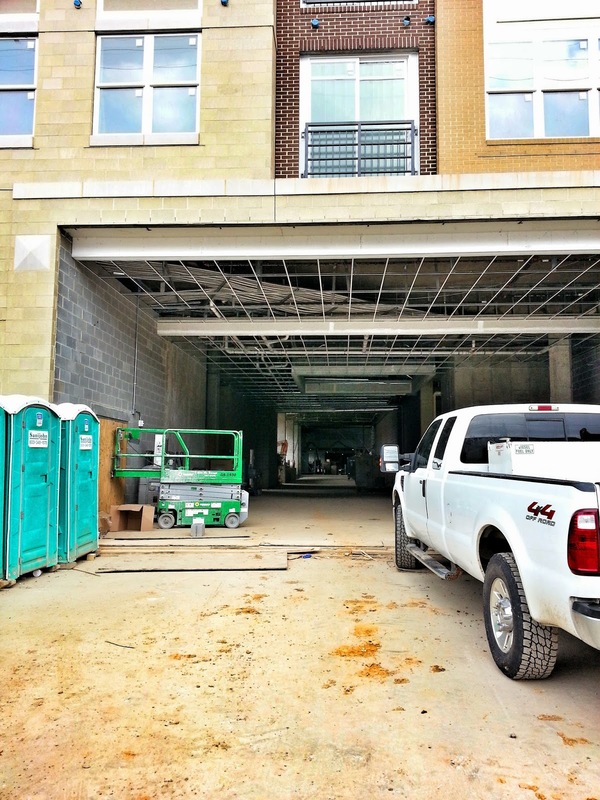 The commission will take up the waiver request at its April 8 meeting, at 7:00 PM in City Hall. 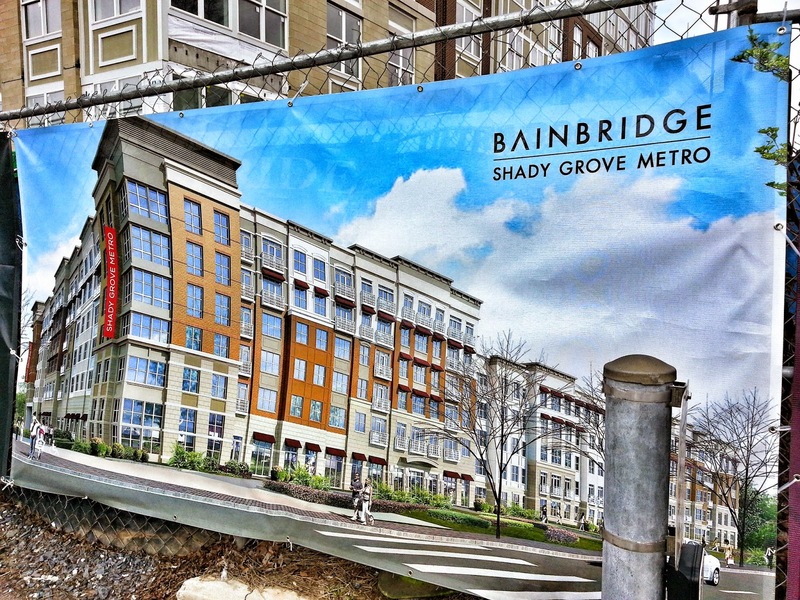 The future Bainbridge Shady Grove apartment building has come a long way since my last update. 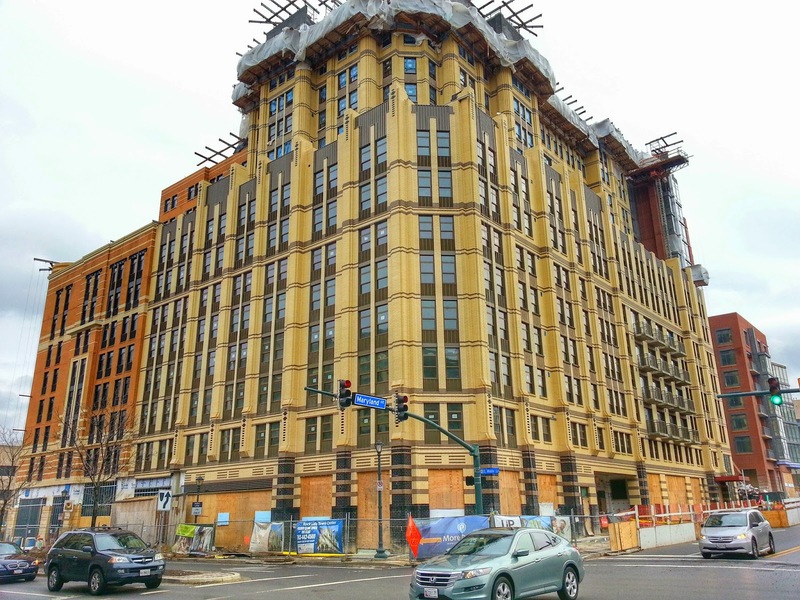 It actually now resembles the multi-colored facade found in the above rendering. "Reed Brothers Dodge - what's that?" It's the historic Dodge dealership this building replaces, a former landmark at 15955 Frederick Road. 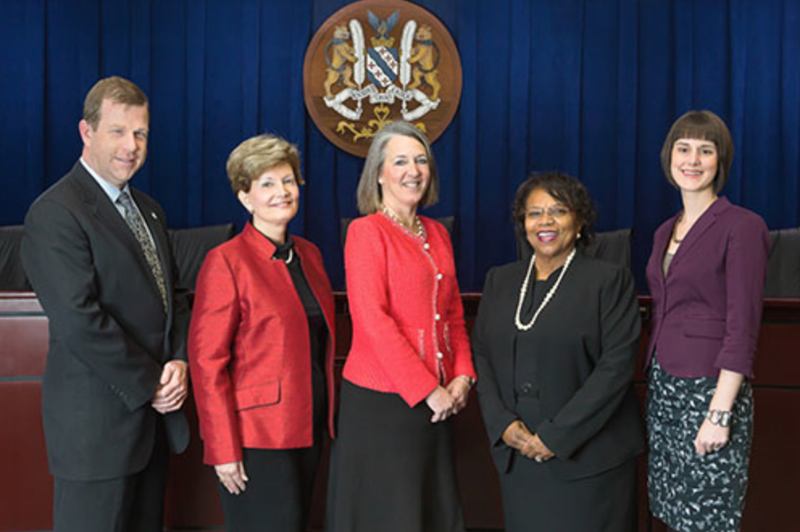 The characterization by official Rockville public relations materials that the Mayor and Council "declined to vote" on changes to the city's Adequate Public Facilities Standards on school capacity has generated some controversy among city officials and residents. 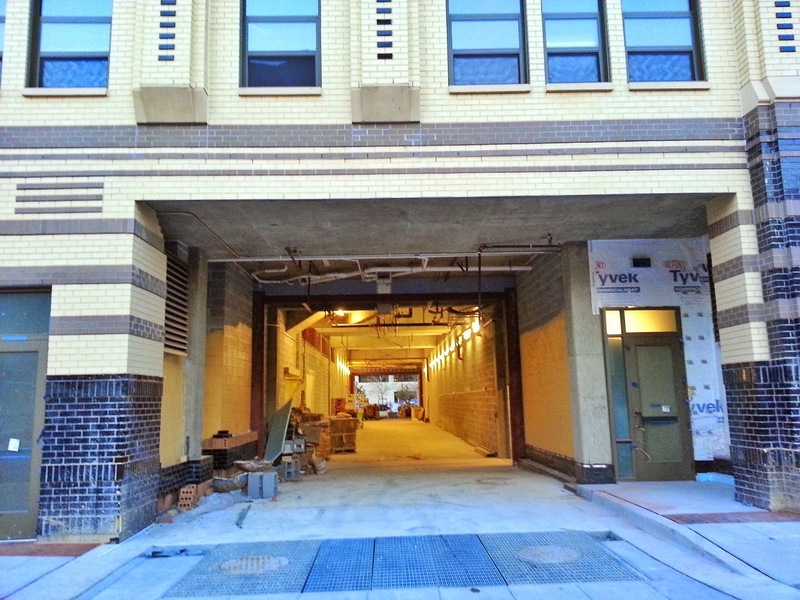 Mayor Bridget Donnell Newton said "I think we need to correct the record," on the wording in Rockville Reports that the Mayor and Council "declined to vote" on changes to the APFS. Rockville Reports is the official city newsletter that is mailed to all residents, making it an influential source of information. The "factually incorrect" statement created a "tsunami" of inaccurate coverage, Newton said. "The Gazette wrote it, Rockville Reports wrote it," and other communications included the characterization of the APFS decision, she said. Councilmember Tom Moore disputed the inaccuracy of the statement. Newton said the characterization was "disingenuous," as Moore withdrew his motion when he realized it would fail. "You were the one who put it on your Facebook page first," that the council had declined to vote, she noted. 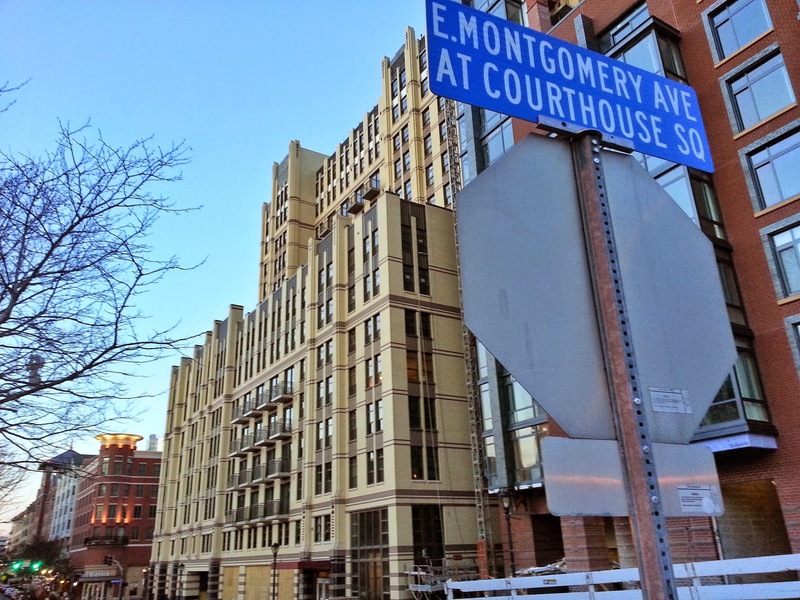 Moore's motion, which would have weakened the city's APFS standards on school overcrowding, and put them in line with Montgomery County's lower standards, was withdrawn by the councilman at the February 9, 2015 Mayor and Council meeting.